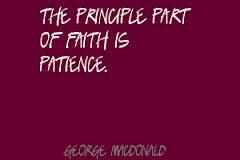 Patience is not a virtue, but a necessity! Another Monday morning! Rush hour. After the lazy weekend, getting to work, finishing up at home, battling insane traffic and plunging into the everyday rough and tumble of a working week __ apart from the stress you feel, there’s a lot your body is taking. And that’s, seriously, not great news! What you need now is not a chill pill, but to learn to be patient__with yourself, with others and with Life! Yet, despite my friend’s well-reasoned pitch, today’s world requires patience more as a must-have quality, a necessity, than as a rare virtue which, when available and used, can create value! Because patience alone can lead you to a Life of peace, personal well-being and prosperity. Now, review your own Life in the context of these three statements. You will find that anything you have got so far from Life, stuff you have welcomed and have wanted, has come ONLY per these three dimensions of Life. You may have wanted something and may have been frustrated. And it has never come. You know your story better than anyone else. So, think back, and ask if you got anything you wanted any earlier or any later than when you finally got it? Were you not in total receiver mode to have got it? And you only got something when you truly deserved it. Patience is about simply understanding these three dimensions and reminding yourself of them every time you mind grieves or frustration sets in. I have learned patience the hard way. It first appeared as the twin truths of Life that Shirdi Sai Baba taught in his lifetime. Whenever I saw them __Faith and Patience__at his temples, I was drawn to them for their simplicity, but I also, initially, believed they were impractical to internalize and practice. Over the years, having faced Life and learned from it, I have painfully discovered that being patient is the only way. Because impatience can create chaos where only confusion prevailed. That impatience can vitiate and make knotty a simple problem situation. That impatience makes you miss the magic and beauty of Life. That impatience makes you imagine that a dark night will never end. Whereas, the truth is that the night is the darkest, just before dawn! Patience is also about having faith in and in trusting Life. Trust that if you have been created, you will be looked after too. Have faith that none of our stories will have a gory end. That each test is Life’s way of reminding you that you are NOT in control. When you trust Life, and learn to be patient, your problems don’t worry you or bother you or haunt you anymore! You then begin to live fully, happily, despite your circumstances. Author AVIS ViswanathanPosted on February 18, 2013 March 14, 2016 Categories Art of Living, Faith, http://schemas.google.com/blogger/2008/kind#post, Intelligent Living, Mondays, Osho, Shirdi Sai Baba, TrustLeave a comment on Patience is not a virtue, but a necessity!